Something a little different here. 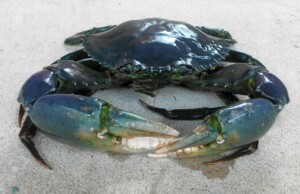 This blue mud crab came from a spot near the NT’s Gunn Point, called The Blue Holes. The odd colour is a quirk that mud crabs sometimes display. If the crab nips, you could swear blue murder … then sing the blues. Sorry. More about “Swoffa’s” crab here.